SO the wife wanted to do something for the Willys project for my Christmas present. I figured having her do the seats would be a good fit for her. We talked to the upholster and got everything set up. THEN came my side of it. I had to get the three seat frames ready to be recovered. Now dad had done the front seats in the std. 4" foam Nagahyde box corner style back in the early 60's the rear seat never got done and us kids just sat on the old spring and horse hair cushions. So everything had to be sand blasted and painted. WOW is that a deceptive sentence. I have done a lot of sand blasting I have been painting stuff like this since I was a little kid (more then 4 decades ago) but these three seats have turned out to be one PITA project. From trying to sand blast inside a visqueen tent in the carport to damp sand to having a huge head and chest cold to MAN do these seat frames have a lot of surface area!. The new plywood bottom boards were easy. The rear seat is currently hanging up with what will most likely be its last coat of paint. I'll let them all cure in the living room near the pellet stove for a few days before I take them to the upholstery shop. I also today talked to one of the few mechanics around that has a distributor machine about setting up my IAT 4405 (vacuum advance) dist. once I get it cleaned up and ready. I'll have to set it up with points to do the advance curves (his machine can't handle a magnetic trigger) but then I can swap in the Petronix unit. The springs are a tiny bit stretched but I hope I can just bend the tabs and get the curve on since finding replacement springs is near impossible. 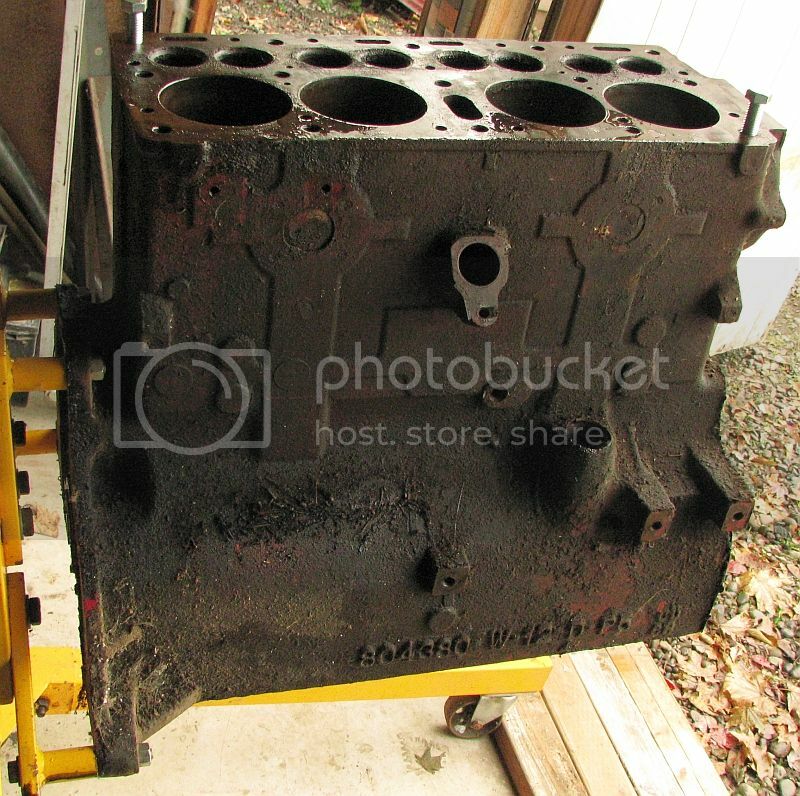 Tomorrow I run down to a buddy's from work to pickup a Cherry picker so I can strip the block and get it to the machine shop. Gotta get this stuff done or pretty soon it will be March and some guy will be calling me back to work 60 hours a week. I'll post photos later of the pretty seat frames. Seat frame photos. I wasn't worried about a nice finish on the backs where they will be covered by the upholstery. I used Krylon hi build Red Oxide Primer then Krylon DUAL Superbond in Satin Black. Glad these are done. Thanks guys I'll add a pair to my next Order from Walcks The ones shown in the photo have what appears to be 7 coils mine (that are in the Distributor not saying they are the correct ones) have 8. I'm going to go at this problem by collecting up anything that looks close and I'll figure out what to end up using when I'm standing in front of the Distributor machine watching it spin. OK an update and a little Happy dance. I got the engine up off the floor started stripping all the external stuff off it and then got it on a stand (funny thing the stand came from a Willys guy and the arms were already adjusted and locked in place to fit my block LOL) So once on the stand I got serious after pulling studs (figured I do this myself it can only save me money at the machine shop) I went to Salem picked up a Handy Dandy adjustable Stud Puller (with a life time warrantee which its live is about over LOL) The guys at the Tool store recommended some super duper rust juice so I got some of that as well. Let everything soak over night and today went after the head studs. 3. took my propane torch and adjusted the flame so it would burn pointing straight down and circled the stud about to be attacked for about 2 min. 4. 2 taps with a 20oz ball pen straight down on the end of the stud. 8. tiny happy feeling as each one gave up its hold and let go. 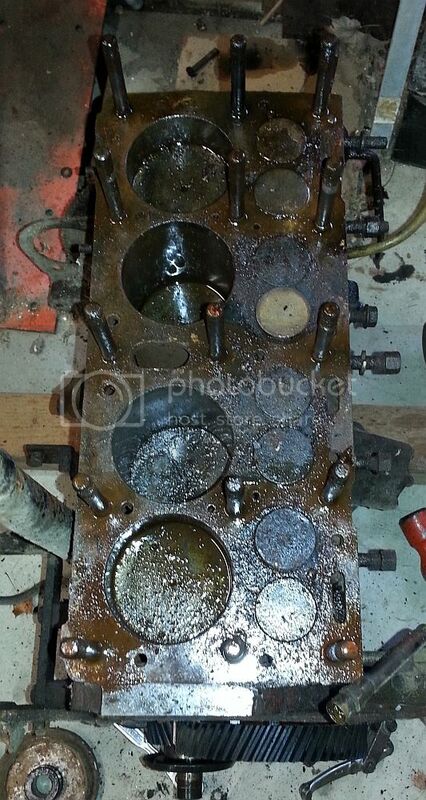 Results all 15 head studs came out free and clean with no damage to the block or my heart. So the happy dance was a little premature as two of the manifold studs decided to screw with me and twisted off flush with the block (either side of #3 exhaust). So tomorrow I'll flip the block on the stand get my handy dandy Black and Decker drill guide a centering drill and drill them out to fit one of my easyouts. Should that prove ineffective I'll drill them out to run a tap in them and cut the old stud threads out of the block. In any case shouldn't take more then an hour. I done this kind of thing in much worse places then a block on an engine stand. 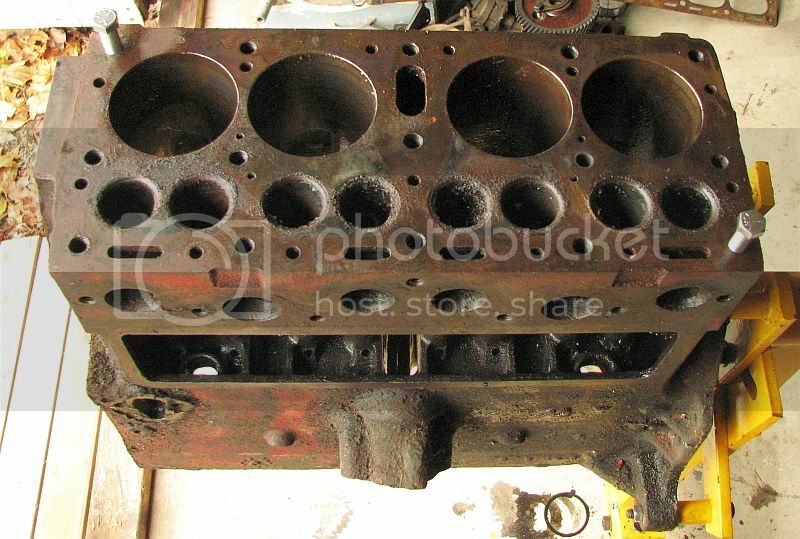 Once that done and I have a couple more brackets pulled off I'll get the oil pump and then start taking out the valve train (its ALL getting replaced) then off to the rods and the crank. 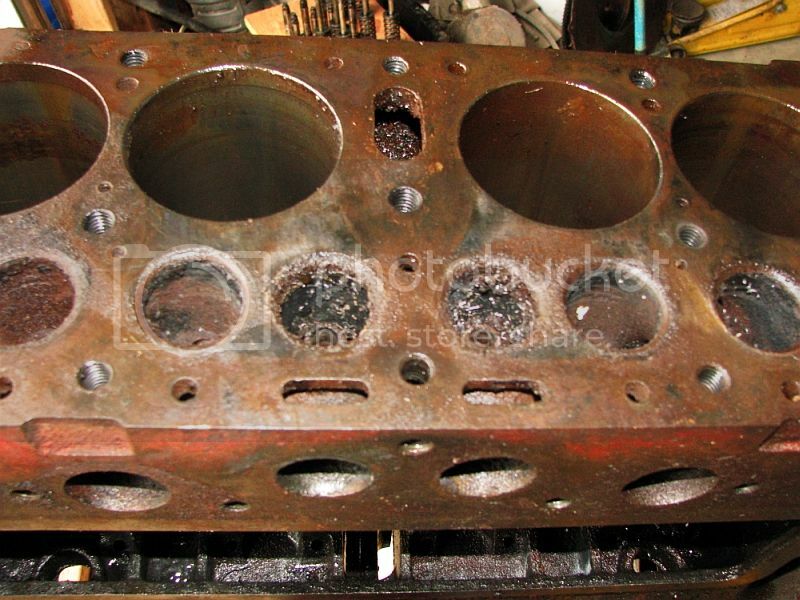 I been soaking the pistons in ATF for about 3 year now and a few days ago started with PB Blaster and now as of last night I have the cylinders soaking in this new Rust Juice. Hopefully a few gentle taps is all it will take to pop the rings loose. I could be ready to drop this off at the Machine shop as early as Monday afternoon!!! 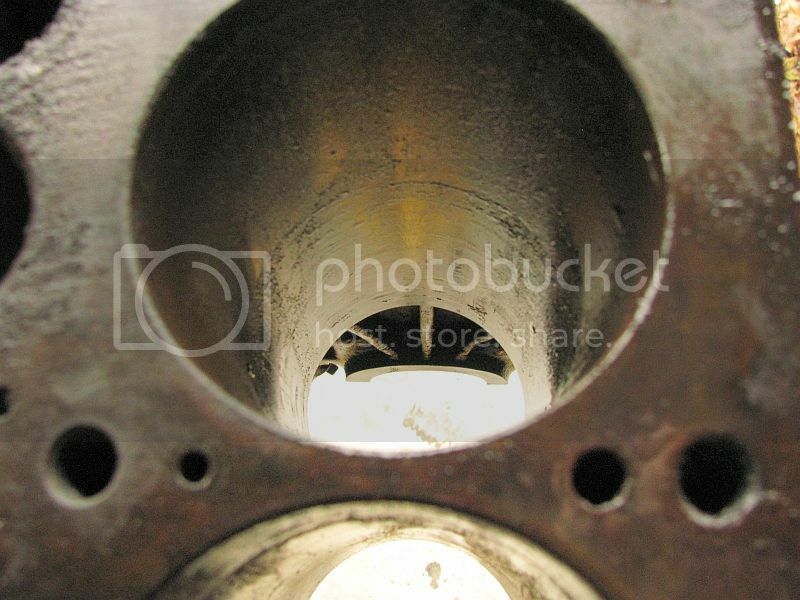 SO far no obvious cracks any where and this was when parked a water/oil and compression tight running every day motor. Still would be if the evil little brother hadn't pulled the head 35ish years ago. Found it in a boat store. Very pleased with it. My block was also frozen for a few years. Well hopefully tomorrow the stuck everything will be no more as its all coming apart tomorrow unless something goes horribly wrong LOL. So Today was eventful. The two busted Manifold Studs were not done screwing with me. In the end I won sort of I got both out (with a drill bit) and managed to get both holes threaded. But I fear neither is up to the thread quality I want so I'll have the Machinist install Helicoils while he's doing all the other good things. It should cost a lot less with a stripped block sitting on a bench then the cost to my soul it would take to do it down the road working over the fender. Both holes will hold 35 ft lbs of torque but I still don't trust them. After wrestling with the Valve train its all out. MAN was it a chore to twist out some of them Valves. It appears at one time 3 of the Valve guides were replaced as they are different then the others. The Pistons were a challenge as well after pulling the Crank (which looks beautiful as does its Main and Rod bearings) I had to pound them out. I have a big round piece of canvas Micarta that looks like a Huge 1" thick toilet paper tube that was just under the size of the bore (note to all who read this if you do this be sure to dry the rust juice out of the cylinder first cause it was like a spray can exploded first time I hit that tube with the hammer LOL) The Cylinders look pretty much like I expected. If .060" cleans them up (they are already at .040" over) it will be a minor miracle. #1 was especially a PITA. No call for work tomorrow so maybe step #2 Take Bare block and Head to Machinist for Tanking and Magnifluxing and Evaluation could happen. I'll snap some groddy Pictures tomorrow to show you all the nasty hunks and pieces. Seats got dropped off at the Upholsterers and details ironed out with him, He says expect 2-3 weeks. Block and Head got dropped off at the Machinists today. First step is to get them boiled clean and Magnifluxed so we know what we got to work with. He wasn't to worried about the condition. But then its not his money..................yet LOL. And here are the groddy photos I promised. Can't wait to see what it looks like done! Actually does not look too bad, I've seen worse. Todays up date I'm third in line for the chem tank/sand blaster and Magniflux treatment I should know what I have to work with by next Friday. WOW How I hate trying to get back into a project that got stalled. Today I started to see what it would take to get my new shackle mounts and shackles done. 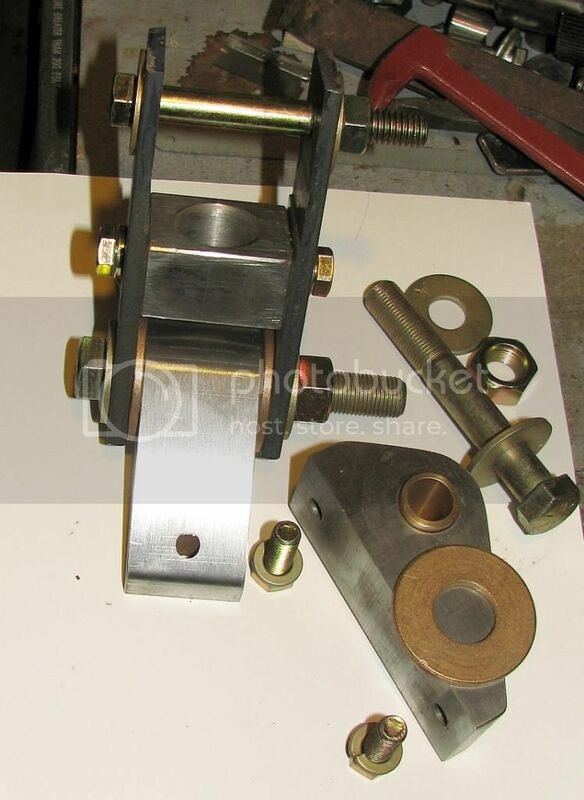 Well after searching the shop the carport/Willys reconstruction center and my office I determined that I had lost one side of one of the front shackles as well as the center section for that shackle. It wasn't until the 3rd or 4th time I stirred up all the misc parts where I thought they would be I found one of the bushings that was missing. OH not to mention a whole bunch of them cheap Grade 8 bolts! So off to the hardware store with my list of needed fasteners. then a second trip to the hardware store cause I grabbed 3) 7/16" NC X 3.5" bolts so fast they turned into 3/8" NC x 3.5" bolts. So once home I attacked the missing shackle side. Only to pull a bone head mistake and not have the parts clamped down while drilling a 9/16" hole the result screwing up the original I was using as a drill guide and the new one. SO now I have two new side plates and they match perfectly since I made them at the same time LOL. 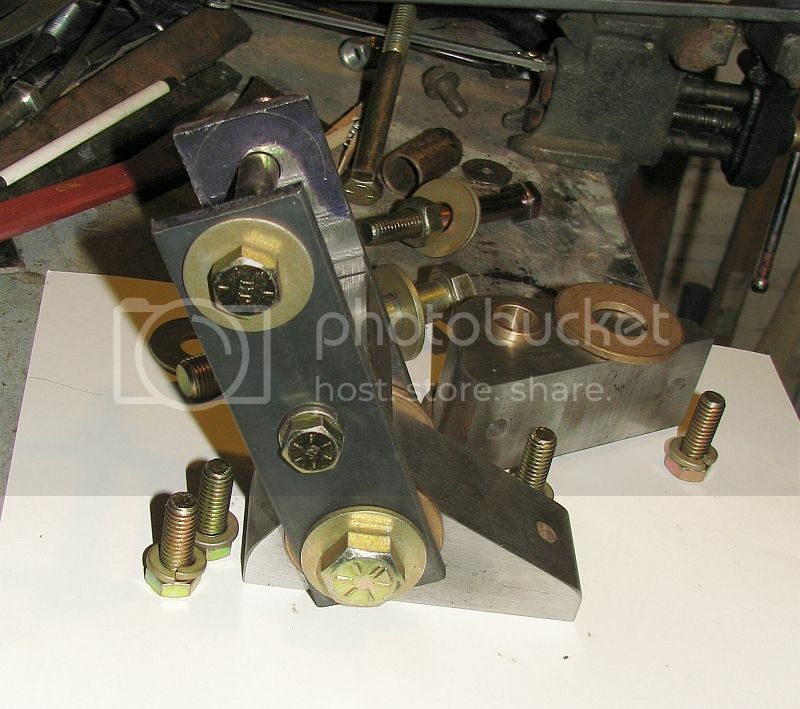 Here is a look at the new shackle mounts that will be bolted to the frame and then welded in place with a backing plate on the inside of the frame. As well as one of the shackles (I still need to round the ends) The bolts need to be center drilled for the grease zerts and the grease passages. I should be able to have all the new shackle mounts, shackles and other machine work with this done tomorrow and have it all bolted together waiting for the Welder to glue it all together. A Note since I am not trying to lift Chug at all these are very close to the original C shackles in length. I figure the brand new springs will jack Chug up plenty compared to what I was used to in High school since they were already 25+ years old when I started driving it. 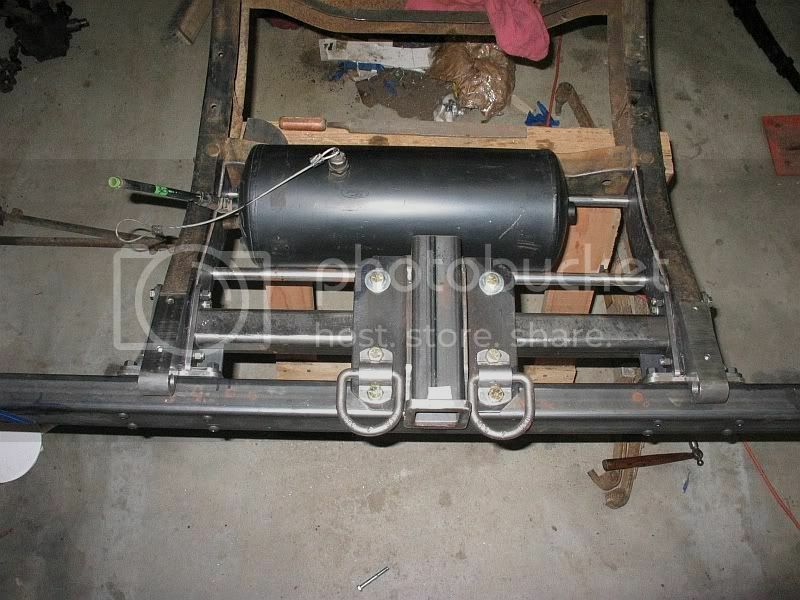 You can see the LONG rear shackle mounts I had to make to allow the CJ5 rear springs and the 81" WB to fit the shortened frame (to fit the 2A tub). A note the air tank is most likely not staying. HOT DANG. 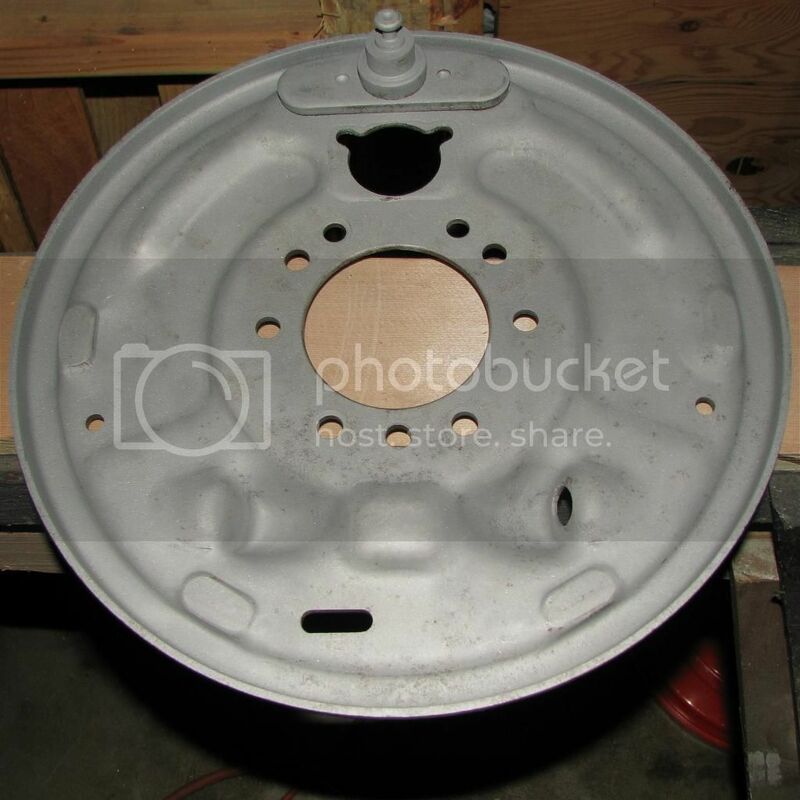 last night I posted an ad on one of the other Willys Forums for the 9.25" clutch flywheel I need in order to run the larger clutch on Chug A Lug and I already have an offer of one. Now that's some quick service. I been wanting to get started on upgrading the clutch linkage but holding off because I wasn't sure if I could do the 9.25" clutch. This will get me going. 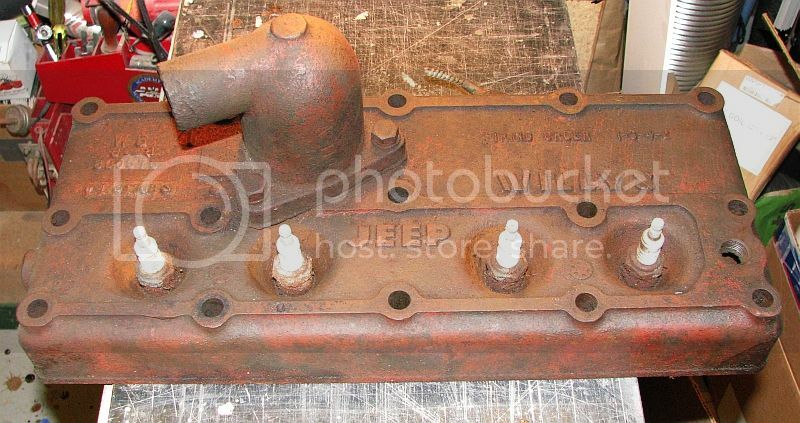 NOW to figure out which bell housing to use with it and the Toyota FJ starter conversion I am going to do. OH and today I got my little 30 gallon garbage can sandblasting cabinet all set back up and working again. 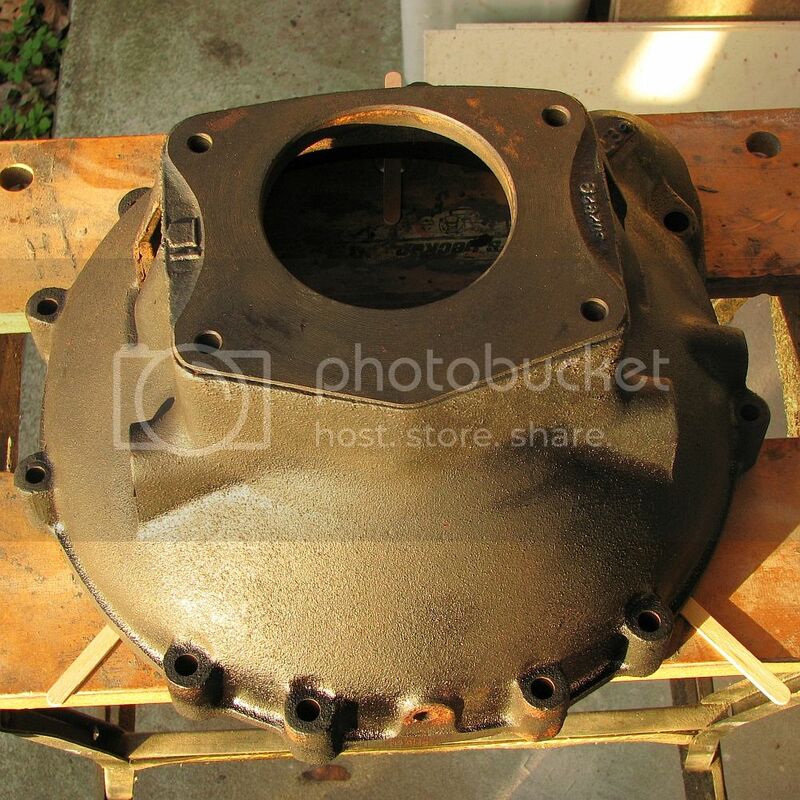 Its just barely and I mean barely big enough to get the 11" Brake backing plates in there and all cleaned up. I got one of them done today the other rear one tomorrow. Going to use some Real Hammerite Industrial Blue smooth finish paint I have on them. think that will look nice and show them off a little Chassis Black Axle with Blue backing plates. 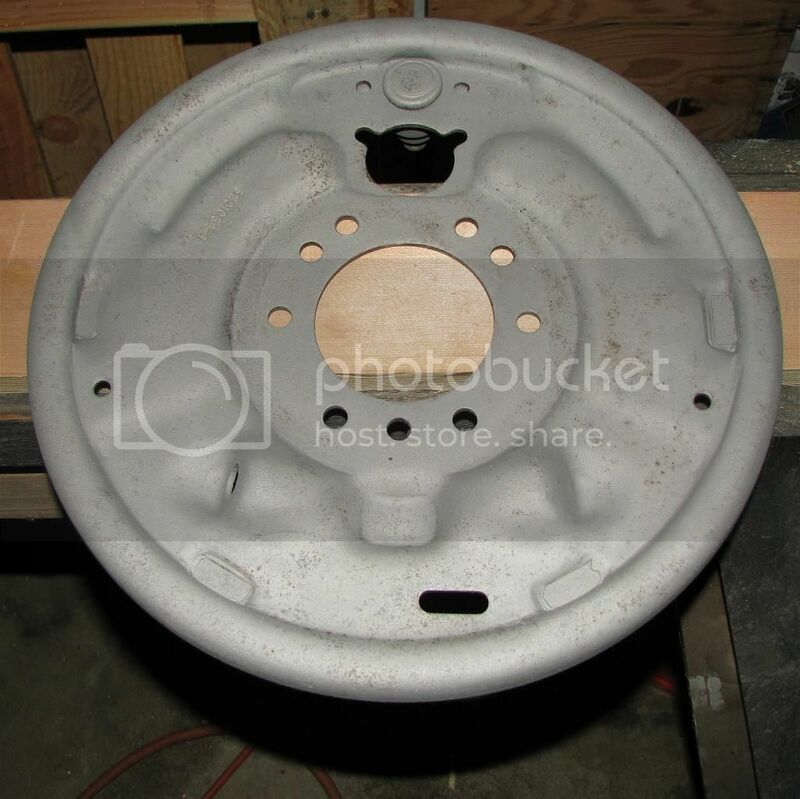 The front backing plates are still assembled to the front hubs the guy included when I bought them from him. He had just upgraded his brakes with 11" and everything new then a couple weeks later his buddy destroyed his jeep and offered up his DANA 44 axles so the guy put his DANA 25 with the new brakes up for sale. No one wanted to pay the shipping so the price kept dropping. I offered him his asking price for the axle if he would pull the brakes and send them to me. He included everything from the King pins out including a nice set of Warn hubs. I'll get around to prettying them up when I get to the front axle. MAN this is getting to be a bunch of fun. Just a couple photos to prove I been working on it. Next the 11" backing plates freshly sandblasted and ready to be phosphate coated and painted. It was a huge PITA getting them that way in my little 30 gallon garbage can sandblaster cabinet. If I could have got my real bench top cabinet set up it would have been a lot easier. 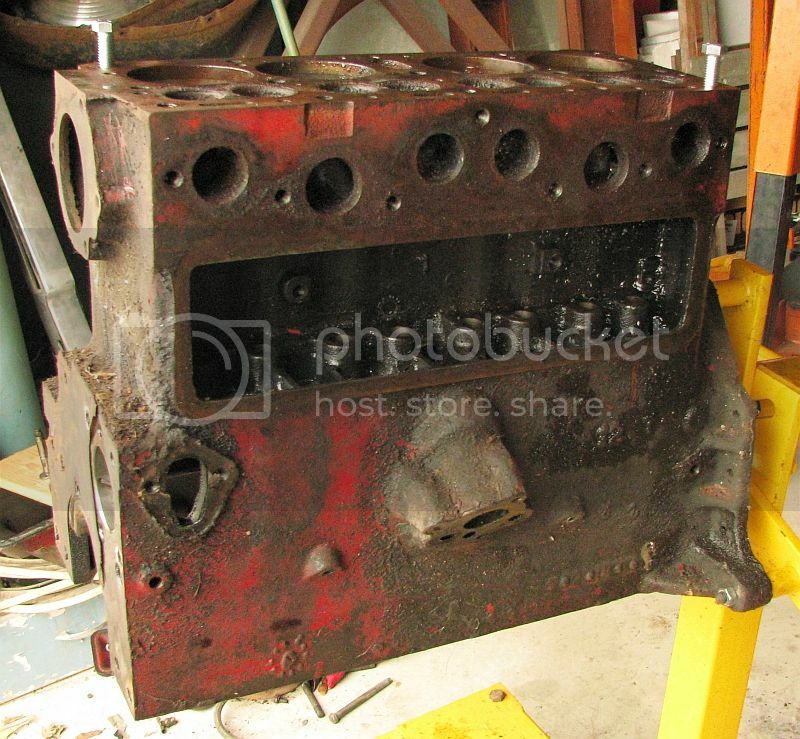 But its buried in the shop and I would have had a bunch of work to get it going. Looking forward to seeing what they look like painted with all the Purdy new and restored brake parts on them. Ready to slap onto the ends of the DANA 44 housing I have.